The Transatlantic & Caucasus Studies Institute promotes and facilitates a new understanding of international issues, free of political partisanship and institutional bias. The Institute's director Ziba Norman was interviewed by the Voice of Russia UK, and discussed the change in government in Georgia (9 October 2012). We are delighted that Transatlantic & Caucasus Studies Institute board member Mark Littlewood has been appointed Director General of the influential London-based think-tank the Institute of Economic Affairs. The IEA has promoted an understanding of the role of markets in society since its foundation in 1955. Mark takes up his new role on 1 December 2009. It has been reported that Armenia and Azerbaijan have reached some agreement on a four-point plan with the aim of reaching a resolution on the disputed territory of Nagorno-Karabakh. Whilst no official agreement is likely to take place without the participation of the Minsk Group and the OSCE, it is hoped that both organisations foster the positive direction in which the discussions between Turkey, Armenia and Azerbaijan are going. Cautious optimism and a resolve for peace must be the way forward. We are delighted to be able to reproduce Xu Youyu's article "The Debates between Liberalism and the New Left in China since the 1990s" which reviews contemporary debates within China about globalisation, capitalism, freedom of thought, and China's relationship to the West -- and provides background to China's Charter 08 movement, launched last month. The incoming US administration will face a range of foreign policy challenges around the world. What changes in US policy in the Caucasus region should we expect? In the immediate aftermath of the Russo-Georgian War, Turkey finds itself in the unenviable position of holding the key to re-establishing balance in the region. As we write this, almost two million people are heading inland from the southern US coastline, fleeing Hurricane Gustav. Readers may be interested in our Hurricane Katrina analysis from September/ October 2005. "The challenge of Katrina is twofold: policy responses that take these lessons into account cannot themselves be simple; and, given the current political dialogue, there is no way these policy responses can easily be aired." President Medvedev has officially recognised Abkhazia and South Ossetia as independent states. This move, taken in clear violation of international law and one with very clear advantages for Russia, marks the end of the first chapter of a story that began with an engagement between rebel separatists in South Ossetia and the Georgian army on 7 August, and ended with an invasion by Russia, supposedly acting as peacekeepers in the region. Russia can no longer hide behind the claim that she was operating as a peacekeeper in the volatile Caucasus. Russia's challenge to Poland is loud and clear, it is a challenge to all members of NATO and the EU. Podcast (mp3 audio) of highlights from our panel event on the Nagorno Karabakh conflict, 29 March 2007. Chair: Ziba Norman. Speakers: Thomas Goltz, Mark Grigoryan, Famil Ismailov, Thomas de Waal. Podcasts of highlights from the symposium, introduced by Ziba Norman. Each of the four topics discussed is presented in a separate podcast. How wise is it of the U.S. and Europe to cultivate a dependence on Russian state-owned Gazprom? Who is involved? See our people page. How is our work organised and what are our plans for the immediate future? See our projects page. Articles and opinion pieces are listed on our publications page. Media releases are listed on our Press Releases page. Find out about our events, past and future. Information about the March 2005 Madrid Summit and our lunchtime briefing is on our Madrid Summit page. What is World Freedom Day and why should we celebrate it? See our World Freedom Day page. We have recently established the International Commission on Economics and Security (ICOES) as a forum for research into economics and security. See our contacts page for all email and postal details. 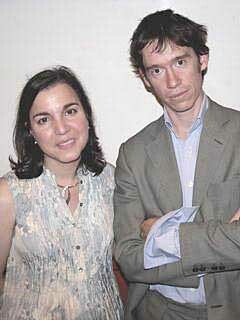 Photograph: Transatlantic & Caucasus Studies Institute director Ziba Norman with Rory Stewart, Member of Parliament for Penrith & the Border, former Harvard professor, soldier, diplomat, deputy governor of two Iraqi provinces, author, television presenter (William Arthurs). 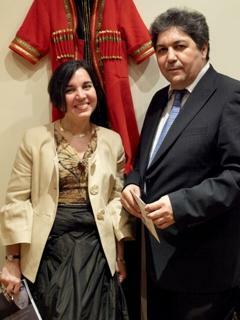 Photograph: Transatlantic & Caucasus Studies Institute director Ziba Norman meets Annakuly Nurmammedov, author and scholar, former Ambassador of Turkmenistan to the Republic of Turkey (William Arthurs). 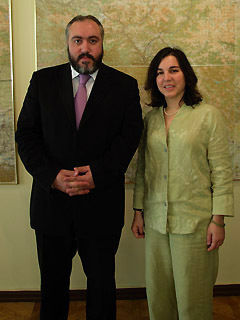 Photograph: Transatlantic & Caucasus Studies Institute director Ziba Norman meets Temuri Yakobashvili, Georgian Minister for Reintegration, in Tbilisi, 19 September 2008 (William Arthurs). Views and opinions expressed in publications, at events or venues provided or organised by the Transatlantic & Caucasus Studies Institute, are the contributor's own whether or not the contributor is associated with the Institute. We provide the means for such views and opinions to be offered, in the spirit of encouraging reasoned critical debate about international issues. The Transatlantic & Caucasus Studies Institute has no corporate view and supports no political organisation or policy. Academic freedom and freedom of speech are prerequisites of the debate fostered by the Institute.